Toy Advent Calendars are a fun way to build on your kids excitement about Christmas each year. There are so many to choose from, and with everything from LEGO to Monster High and Minions, you will surely find one of your child’s favorites to help them count down to the big day! I had no idea that there were Toy Advent Calendars available until just a few weeks ago when I caught my daughter watching a series of videos on Youtube where they were opening up the daily surprise from 3 different Toy Advent Calendars. So I went searching on Amazon.com and was blown away by the many different toy themes you can find in an advent calendar! In the past we have gotten cheap ones from local stores that had chocolates in each window, but half the time I couldn’t comfortably let her each the chocolate – it looked kind of old and not appealing at all. Finding that I can pick up an advent calendar with toys in it?! Such a relief that I won’t have to disappoint her with the “Oh! – baby you can’t eat that…” again this year. So, without further ado, scroll on to find an awesome looking Toy Advent Calendar to get for your family to enjoy this coming December! One of the most popular toy advent calendars are those made by LEGO. With numerous themes of LEGO sets available, there are almost as many themes available in LEGO Advent Calendars. In sets suitable for either boys or girls or both, you can even pick up one for each child so that they can all have their own special countdown to Christmas fun every day! These Star Wars LEGO Advent Calendars are sure to be very popular this year with the Dec. 18 release of Star Wars: Episode VII in theaters. Star Wars has been a popular favorite theme for decades, so kids and adults alike will love seeing what new toy is hiding behind the window each day. There are more than one Star Wars LEGO Advent Calendars, we found all we could and listed them below to let you pick your favorite. These LEGO Star Wars Advent Calendar Games are suitable for ages 6 and up, so be sure to use caution if you want to give one to a younger child. There are small LEGO pieces that could pose a choking hazard for small children. These LEGO City Advent Calendars are another popular option for LEGO fans. Featuring toy pieces that go great with any LEGO City building sets, it is a great way to add to LEGO sets you already may have. There is more than one LEGO City Advent Calendars as well, we have listed the ones available below to let you pick your favorite. These LEGO City Advent Calendar Games are suitable for ages 5 and up, so be sure to use caution if you want to give one to a younger child. There are small LEGO pieces that could pose a choking hazard for small children. These LEGO Friends Advent Calendars are a popular option for girls who are LEGO fans. Featuring toy pieces that go great with any LEGO Friends building sets, it is a great way to add to LEGO Friends sets you already may have. There is more than one LEGO Friends Advent Calendars as well, we have listed the ones available below to let you pick your favorite. I’m loving the set 41040 you can see to the right here for my daughter this year. These LEGO Friends Advent Calendar Games are suitable for ages 5 and up, so be sure to use caution if you want to give one to a younger child. There are small LEGO pieces that could pose a choking hazard for small children. The Minions Advent Calendar is brought to you by Mega Bloks. Your kids will enjoy opening a new window every day in the month of December to reveal a new Minions Toy. There are 24 days of surprise toys in the Minions Advent Calendar, each day bringing more fun to the building of your own little Minions play set. In total there are 221 pieces in this set, and it is suitable for ages 5 and up. My daughter loved both Despicable Me and Despicable Me 2 movies and would love getting to open these little guys and their accessories throughout the weeks leading up to Christmas. Littlest Pet Shop also has a bunch of Toy Advent Calendars kids love. Each comes jam full of 24 days of Littlest Pet Shop toys and accessories so that every day leading up to the big Christmas holiday has a little special toy for your child to discover. Hidden beneath the day of windows are even three LPS toys that will add to your child’s collection of Littlest Pet Shop figures. The Littlest Pet Shop advent toy calendars are suitable for ages 4 and up, so be careful with the toys around smaller babies and toddlers. For Barbie Fans, there are Barbie Advent Toy Calendars as well. As with the other toy advent calendars we’ve shared so far, there are several to choose from. Each has 24 days of surprise toys hidden behind little pop out windows to make the countdown to Christmas all the more fun for your little girl. If your daughter is into the Monster High Doll series, then she will absolutely Love these Advent Calendars with a Monster High theme. This was one of the ones I saw being opened in a series on youtube last week, and my daughter who isn’t into Monster High was still enthralled with watching what cool Monster High toy or makeup was in the pop out window each day. Not recommended for kids under 3 years old. 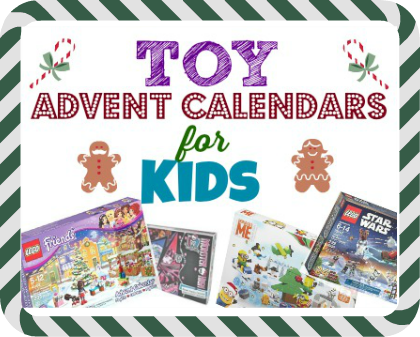 There are so many more toy advent calendars to choose from! I was trying to give a complete list here, and I will add to it over time, but you can always search your favorite toy characters on Amazon.com with the advent calendar after it to see if they make one. You know if they do it would be for sale there! I have a few more popular themes added below – and like I said – I will add more over time, I think I’m on advent overload and the more I see the more I want! Like these two Schleich sets below – OMG! They are awesome looking! Talk about a real country Christmas theme? Okay – I’m leaving you with these to start with – below them I’m going to pop in a search bar that you can use to search Amazon.com quickly for the advent calendar you want if I haven’t included it already. Also, that search bar is great for readers in the UK and Canada – That search will take you directly to your own country’s Amazon sites!